Before I continue – a few words on Wild Wings. We returned home to a very well cared for property, our heartfelt thanks to Bill and Pauline. The dawn chorus on our first morning back reminded us of what a special place this is and we have been enjoying the sounds of the “summer birds” including the incessant calls of the Cicada bird! From Bladensburg we drove into Winton for supplies before heading SW to Carisbrooke Station where we spent a couple of nights. It is a working station with a camping area near a dam and an ablutions block next to the shearing shed which is quite a long walk away. 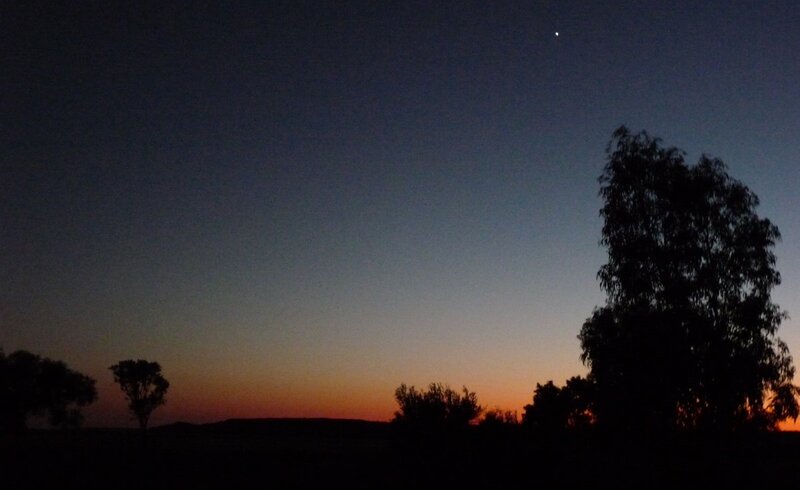 There are various self-drive tours available on the station but we only had one day and enough spare fuel to allow us to explore Diamantina so we enjoyed our camp, relaxed and did some hand washing. One domestic note here; while the dry air plays havoc with my skin it was wonderful to have the hand-wrung washing dry so quickly! 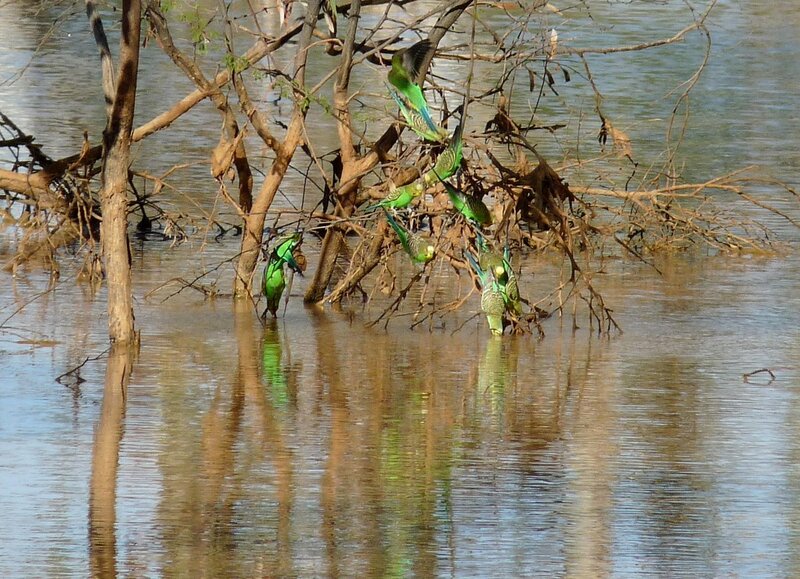 It was a delight to watch the flocks of budgies coming into the dam to drink in the late afternoon; Black-fronted Dotterel took advantage of the dam’s muddy edges; and there was a Pelican, Spoonbills, Egrets and Grey Teal – armchair bird-watching from the open-air ‘living room’ is lots of fun. We also had more views of Mallee Ringnecks which we first sighted in Idalia – the colours of the ringnecks and the budgies are just brilliant especially when contrasted against the clear blue skies of the outback. 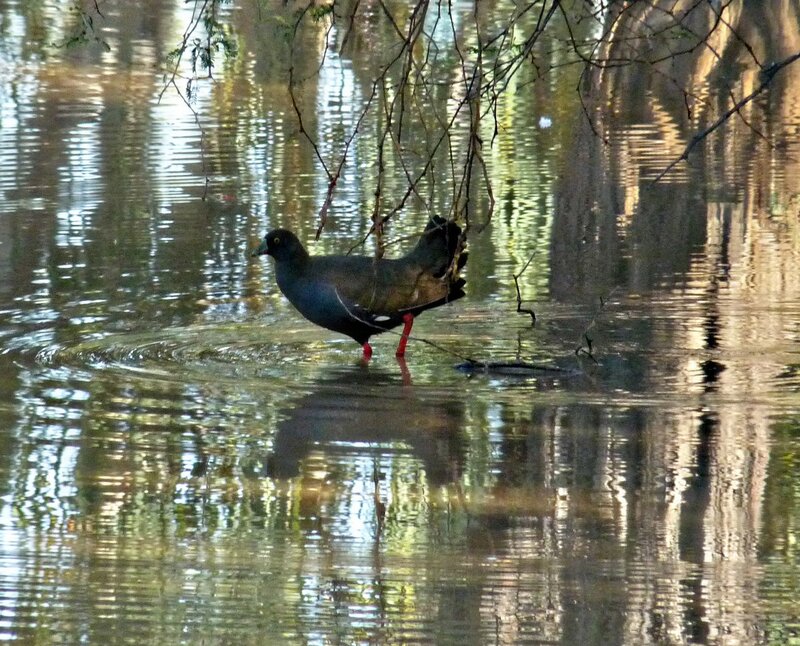 The dam attracted many birds including quite a population of Black-tailed Native Hens – often camped in a group under vegetation but individuals seemed unconcerned about wading into deeper water. The trees around the camp supported large numbers of White-plumed honeyeaters as well as the large Spiny-cheeked Honeyeaters with their amazingly varied vocals. Our highlight for Carisbrooke was a Spotted Nightjar, which we heard first and found as we returned from the ablutions block at night. We walked back with binoculars (we don’t usually have them with us when showering) and managed to walk up slowly and illuminate it with our headlamps and then briefly with a stronger light to get a really good look at the spots. 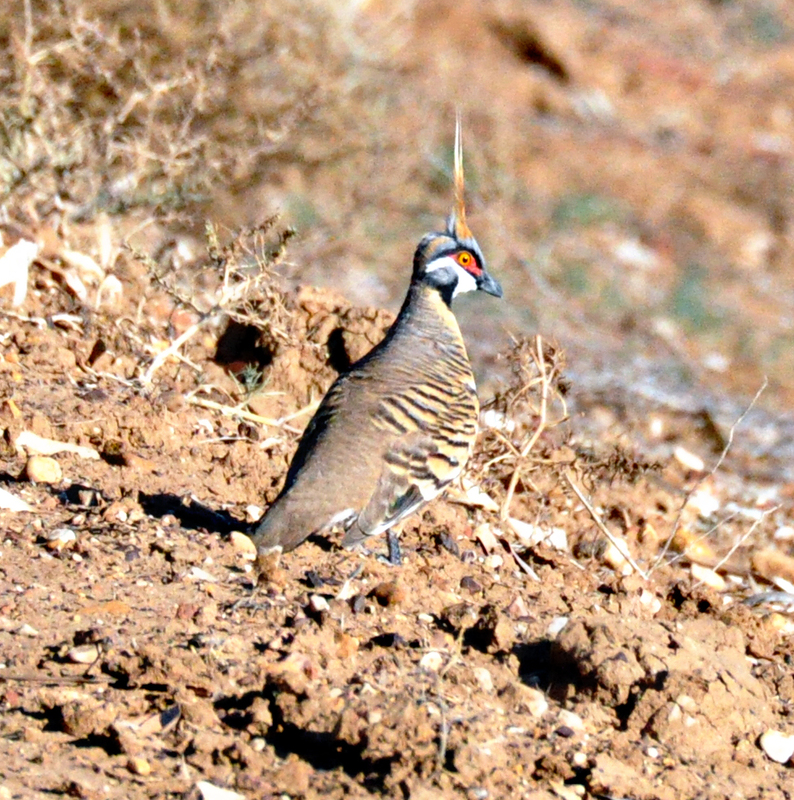 And this is one of my many favourite ‘outback’ birds – Spinifex Pigeon. They are not uncommon but they have a habit of walking away quite quickly when they see a camera. On this occasion there was no Spinifex in which to hide. We left Carisbrooke early so we had plenty of time to enjoy the drive into Diamantina National Park – our next destination. 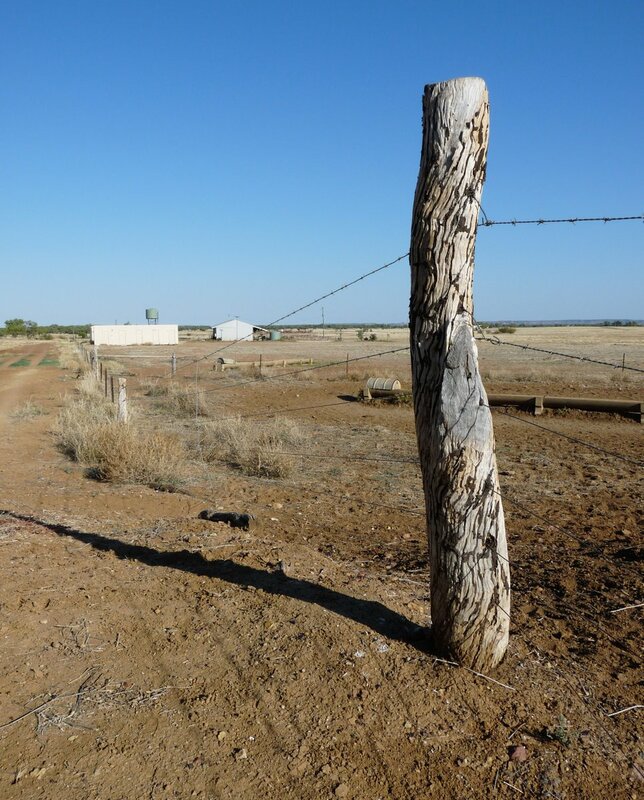 This entry was posted in Excursions and tagged Black-tailed Native Hens, Budgies, Carisbrooke Station, Spinifex pigeon. Bookmark the permalink.